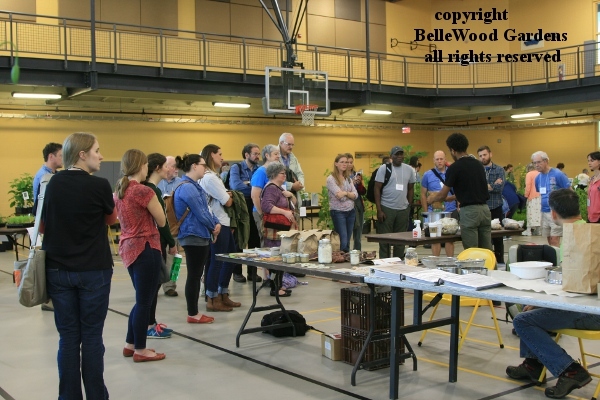 Next, Heather Holm spoke on the Pollination of Native Plants, with an in-depth look at flower form and floral resources offered by plants to attract a diversity of flower-visiting insects from an assortment of bees to wasps and butterflies, their foraging behaviors, and effectiveness as pollinators. How do they do it? Any/every thing from honeybees pollen baskets on their legs to sonication - buzz pollination where vibration showers down pollen onto the insect's back to be carried to another flower. Brief videos embedded in the presentation made for a fascinating talk. The closing presentation at day's end was an excellent talk, with a caveat. Thomas L. Woltz, FASLA spoke on Balancing Culture and Ecology: The Horticultural Passion of Nelson Byrd Woltz Landscape Architects. He presented four projects. The first, Brooklyn Navy Yard Naval Hospital Cemetery Memorial Landscape was an evocative use of the site. Second, Iron Mountain House, a private residence in northwestern Connecticut overlooking a 300 acre working farm on what was once an iron ore extraction site was equally fascinating. It was the fourth and final project - plans for a public garden funded by the Aga Khan in Edmonton, Alberta, Canada that seemed to wildly deviate from "native." Extensive research on Islamic garden style to be translated to an extremely foreign climate, one that appears to have more to do with architecture than with native plants. But it has made me think, and that is a hallmark of a good presentation. 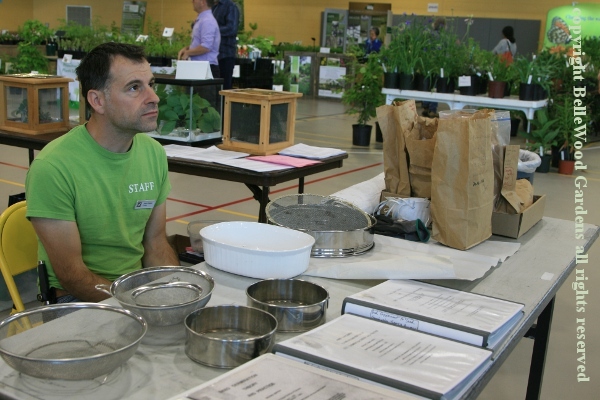 Of course the plant sale and trade show is open in early morning, at the midday lunch break, mid-afternoon, and from 4:00 - 9:00 p.m. when it is also open to the public. small tasting cups of vanilla, mango, or salted caramel ice cream. Or, you could have a root beer float. Talk about a yummy choice. Then wander around looking at plants AND today's demonstrations. One way to grow native plants is to raise them from seed. It's not like buying packages of vegetable seeds. Find the plants, revisit again and again, maybe yet again until the seed is ripe for collection. Be respectful. Don't take everything, only what you need. 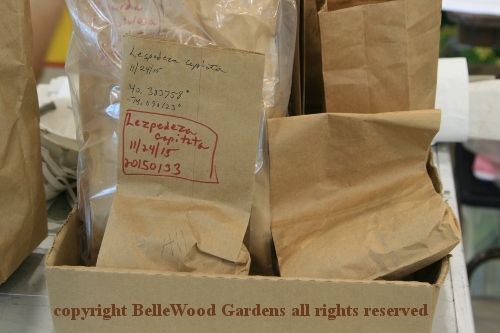 Paper bags, labeled with name of the plant, location / collection site information, date. 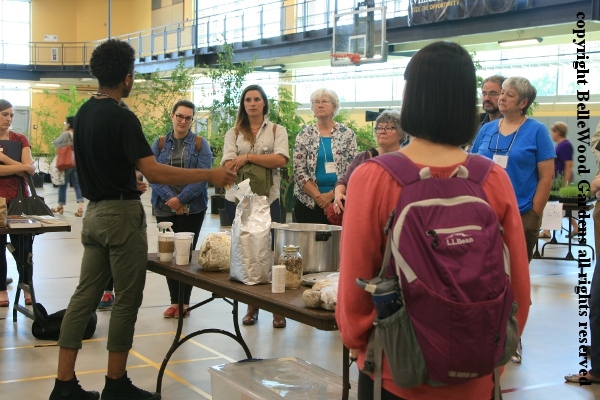 For plants, the name of the game is propagate the next generation. They may have seeds contained in delicious fruit, to be eaten and carried away. Sticky burrs to cling to fur or pant legs, to be carried away. Once collected, the seeds need to be cleaned. Sieves of different coarseness (dedicated for seed cleaning and not kitchen use) can be found in your housewares aisle at the store. This gentleman was ready to explain and answer questions. 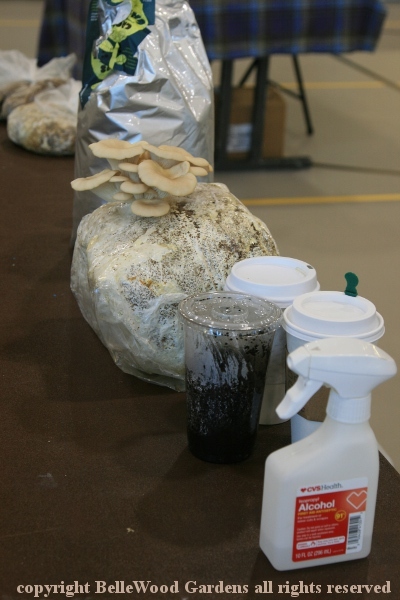 about grow your own mushrooms. 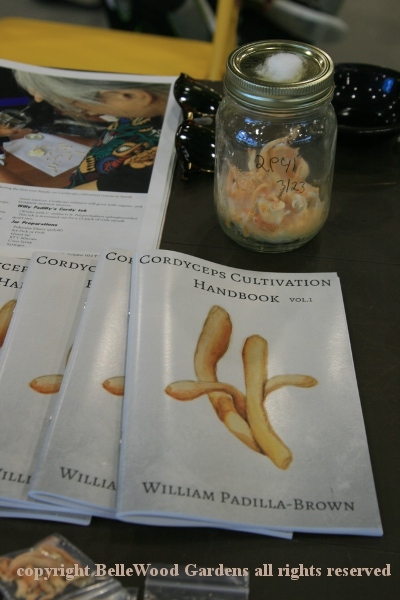 The young man has an interest in cordyceps, which is said to be good for just about anything that might ail you. It: improves respiratory health, increases oxygen uptake, boosts heart health, detoxifies the body, prevents certain types of cancer, slows the aging process, increases energy, and improves the immune system. In China, this mushroom grows on caterpillars. Not here. oyster mushrooms. They are among the easier of the culinary fungi. This evening there's a screening of Hometown Habitat, a 90 minute movie with a focus on the importance of native plants in all landscapes, from small and urban to large and suburban, landscapes already built and multi-dwelling planning stage. 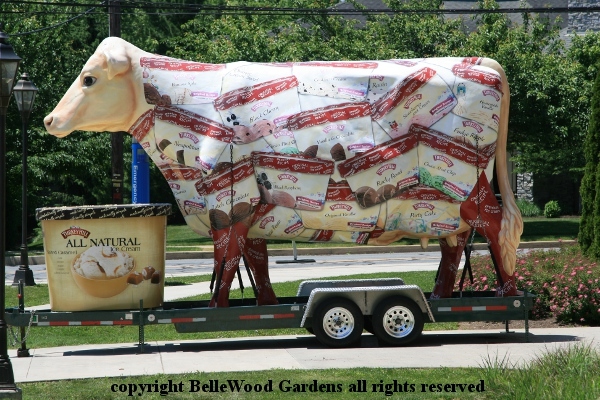 Plant a meadow, it urges, rather than the typical green grass lawn desert that fronts (and backs) so many of our homes. Free and open to the public.